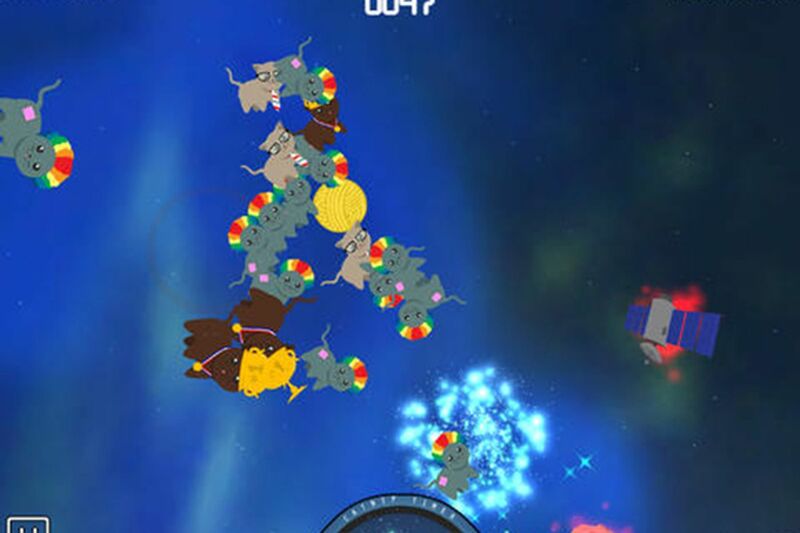 A screen-shot of the Galactikitties game. Gamers are finding out. Galactikitties, an arcade-style mobile gaming app created by a group of Drexel undergraduates, revolves around a ball of yarn that collects cats floating in space. If that's not enough, there's fast-moving space junk and asteroids to avoid. Free-floating catnip and fish can be grabbed for special powers and will help in completing the level. But what differentiates this game — besides the ability to dress cats up as wizards and ninjas before saving them from the perils of space — is that it is launched under Sweet Roll Studio LLC, the first startup company under Drexel University's Entrepreneurial Game Studio (EGS). The Drexel undergraduate creators have not only a passion for mobile gaming, but for saving cats. Some proceeds of the sale will go to the American Society for the Prevention of Cruelty to Animals (ASPCA). Timothy Day, co-founder of Sweet Roll Studio and a computer science major, started working on the game as a project under a course taught by EGS founder and Drexel professor Frank Lee. Lee created EGS as an entreprenuerial environment for students, as well as a sort of mobile gaming and startup factory. Lee is the man behind the world's largest video game of Tetris, played in March on Philadelphia's 437-foot tall Cira Centre. This week, he earned the Guinness World Record for largest architectural video game display for his Tetris feat. As development of Galactikitties progressed in early May 2013, Day recruited game art production major Travis Chandler, and information technology major Jasmine Marcial. Marcial's role was to assist with art design, using an animation tool called Spine, as well as Adobe Photoshop and Illustrator. Chandler helped with design work, including some programming and working on the space background for the mobile game. In the beginning, Day envisioned a side-scroller game similar to Katamari Damacy, a console game where players aim to be the biggest ball of "stuff," collecting random items as they roll around on the screen. "At first, I had envisioned [the game] in ancient Greece, with side-scrolling like Katamari Damacy, rolling around and picking up, well, cats," said Day. Day said that Lee had initially joked about their earlier versions of the game, saying he couldn't see it being any fun. "The major change of [Galactikitties] was the game play," said Lee. "But I had a vision that their project could be a startup company." Lee's vision was spot on, and the app was launched in April 2014. Sweet Roll has almost 400 downloads for Galactikitties, which is available through both the Apple App Store and Google Play for 99 cents. While saving cats in space and trying to advance to the next level, players are also supporting the ASPCA. Sweet Roll is donating money from game downloads as a way to give back and help support the lives of animals. And the cat's out of the bag: The folks at Sweet Roll are also in the process of developing their second mobile game. Chandler said that the company has an idea of a 1920s villains theme, where players complete levels by running to the end of the game and place traps for their opponents to overcome. Its working name is "Hat Trap" and will be most likely have a side-scrolling game play. Since the team has more time to create its second game and has gone through the process of developing and finalizing a mobile game, members plan on assembling a larger team for more help. "This way everyone will have a 'footprint' in the game," said Day. While Sweet Roll came out on top as the first mobile gaming startup under EGS, Lee said that the organization could now work toward creating a more formal process for startups. This could include gaming-design teams bringing their ideas to EGS and working under the studio to complete their prototypes. Lee's vision for EGS remains the same as when he started the company in 2013, and that is to grow the video game industry in Philadelphia and help students become entrepreneurs while still getting their degree. He wants students to not only focus on school, but to start thinking about the future and make mistakes now while there is the safety net of being in college. "If you fail, great," said Lee. "Take all the risks now, do it while it's safe and learn something."